The author of Wow! You Saved How Much? asked if I would like to review her book. My first reaction to the book was how thin it was. It's only 52 pages, but then again that makes it easy to read, and I've seen some "how to coupon" books contain a lot of fluff or all kinds of extra details that can confuse the "newbie". You certainly won't find any of that here. It's a very well written, straight forward book that anyone can understand. You might think coupons are a waste of time or boring or not worth it or a number of other excuses, but as you've read on my blog and as Renita Perrone teaches in Wow! You Saved How Much? you'll see those excuses are just that -- excuses. I will say, though, that anyone can see some nice savings with coupons. While this book does explain what I call "hard-core" couponing, you will learn the basics and if you use what you learn in this book it will pay for itself in the first trip to the grocery store. 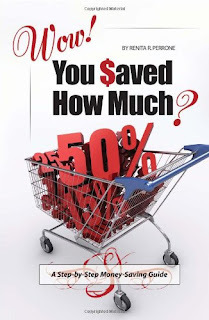 Bottom line, this is a simple, easy to understand book about couponing. I'd highly recommend it to anyone just starting out with coupons. What I liked: The concise, easy to follow way this book was put together. I also liked the ideas of how to trade coupons, where to find them, and other information it took me a while to figure out when I was first learning to coupon. What I didn't like: She didn't mention coupons that spit out at the register when you buy certain items. These can be a gold mine. However, I understand this is for new coupon users, and that can be a bit confusing at times. I did see on Amazon this is called "Volume 1" so possibly she is planning another book. Also, this book was published in 2009, so information will be dated in this volume. As mentioned, I received a book to review. Receiving this book free did not influence my opinon whatsoever. My opinions are my own. I wouldn't consider myself a coupon newbie, but I could use some help in any case. I'm not the best at actually using the coupons I get, so I hope the book would include some tips on organizing that I would find helpful. I learned that the author is a stay-at-home mom since 2001 who home schools her children and has been practicing the method described in her book for 4 years now. I follow you on GFC as Michelle S.
As Ben Franklin said, "A penny saved is a penny earned." That's why I would like to read this book. I believe saving money up front is just as good as making money on an investment. The author wrote the book because she wants to help others. I liked the author's page on FB. I already follow The Radar Report, which recently led me to a free download of a Veggie Tales Christmas album. "Broccoli, celery, gotta be..."
I'd like to learn how to save more money on groceries. This sounds like a great book that I would like to win to share with my daughter-in-law - feeding 3 kids isn't cheap! I'd like to win this book because the holiday season is coming and I need an AFFORDABLE holiday! I follow the Radar Report via FB. I liked Renita Rae's comments about her book. I would like to win her book, as I am just beginning to use the coupons, since I am raising my 9 year old grandson, he has such a huge appetite. The extra savings would be great in the grocery store. As reading about the author she is a SAHM since 2001 and is home-schooling her children and she has been practicing the method in her book for 4 years now. And that Renita like helping others. I need help organizing my sweepstakes and using only ones for items that I usually buy or a new product I want to try. Renita has been a stay-at-home mom since 2001. I like Renita Rae Perrone on her facebook page. I could not figure how to follow you on Google Friend Connect. As a "new" coupon clipper, I went grocery shopping on Saturday with my husband and we had a hand full of coupons. We spent $140.67 and after all coupons were deducted, the total changed to $61.09. My husband was absolutely amazed. I follow The Radar Report on Facebook. I loved reading the author's bio of this book. I didn't realize we had a lot in common: she is a homeschooling mom, stay at home mom, and loves to save money. What a wonderful trifecta we both share! Love (like) the author's facebook page! Love (like) the radar report on facebook! looking forward to all the money i am going to save! Following ya on Google Friend connect! 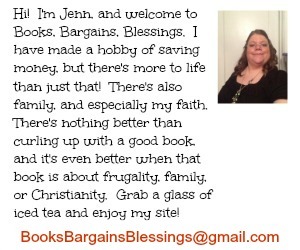 I am trying to save and plan better for the future with rising costs, this book would be so welcome here! We are a one-income household. I won 2 coupons for All clear recently and used them at a B1G1 sale to get 4 free bottles! I need to learn to save more and spend less. Thats why I need to win this book. I learned that Renita has been a stay-at-home mom since 2001. I would like to win this book because we have been trying to tighten our budget even more since my husband has been unemployed for over a year. I want to win, because with the upcoming increase in taxes, and healthcare costs, we are going to need to save every penny possible. I lost my job last year after 29 years. I haven't had any luck finding a job. I would love this book to help us save money at the grocery store. I get bogged down in the coupons. Start out with good intentions and then get too frustrated to make them work for me and end up throwing them out. I need this book to help me learn how to be a Coupon Queen! Thanks for the chance to win. For an extra entry...the author is a stay at home mom. Thanks for this extra chance to win. on Facebook...for an extra entry. I "like" The Radar Report on Facebook for an extra entry. For my 5th entry I now follow your blog. Thanks again for the chance to win. I have four kids....'nuff said! I need a way to save money and it has to be something good. We live on one income so any chance I can to save money I'll take! We are on a very tight budget and live paycheck to paycheck so I am always looking for new ways to save money. We just started on the Dave Ramsey program so any additional ways to save money would be great! I clip coupons and use them quite frequently but I'd love to learn how to get more out of using them. Being a stay at home mom...my job is to stretch each dollar as much as I can. wow... I learned she is very much like me...her 1st child was born in 2001, she became a stay at home mom because daycare was not wanted, homeschooling was planned and of course she wanted to save money any way she could. I need this as with the economy being so bad, I need to learn more tricks of the trade to become more frugal!! I'd love to win it since I'm always looking for new ways to save money.